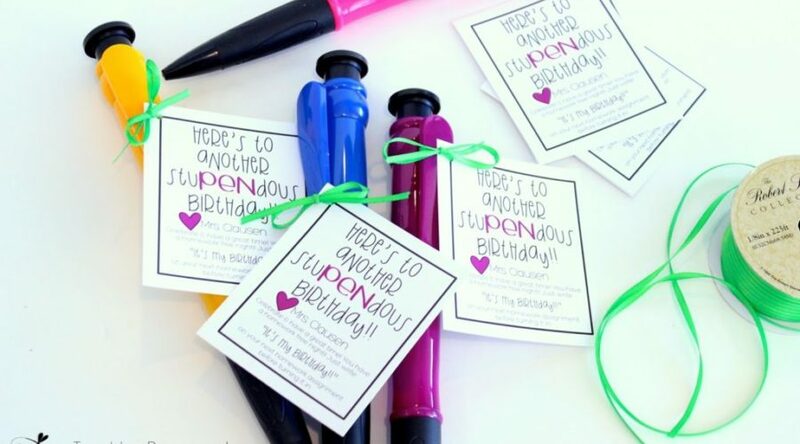 How to Celebrate Student Birthdays - Quick and Easy - with a FREEBIE! How to Celebrate Student Birthdays – Quick and Easy – with a FREEBIE! We are officially back to work this coming week. What in the world happened to summer! I’ve been running around like a crazy person trying to get some last-minute things together. —->New district curriculum = a whole lot of tubs! I cannot tell you how many tubs I’ve purchased and filled over the last few days. I think I am officially over tubs! They are no longer cute and fun – but rather tedious and just never the perfect size! I’ve said, “Nope… not gonna work.” far too often lately. Thankfully, I can finally see the light at the end of that tunnel. Anyhoo, as I’ve been getting things ready I have been implementing a few changes again this year. I’ll share them over the next few weeks. Let’s start with birthdays. I’ve done the same routine for birthdays in my classroom for a while. This year, I am ready for a tiny change. I’m not going to change my birthday chart because it is super easy to maintain, super cute and a space saver, too! I HIGHLY recommend it! I’ve used this for years – and it definitely could use a little updating and reviving, but I don’t think I’ll ever change the main concept because it works so well. This birthday chart is 12 x 12, super easy to read and amazingly simple to update each year. Those name are just typed up on paper that I cut into little strips and slide into those little plastic photo holder tabs. The only thing I change each year is that little slip with the kiddos names and birthday on it. Tiny clothespins hold everything to ribbon I’ve wrapped around the scrapbook paper. It takes up very little room on my bulletin board. Easy- peasy. Here is what I am going to change. That little round tin below the straws holds “birthday magic dust”, aka glitter, that I sprinkle all over the heads of the little birthday child. Who doesn’t love birthday magic?! Anyhoo… I like everything we do for birthdays. It’s fun, easy, and doesn’t take much time. But the straws? I’m over them. I was looking for something different that wasn’t a straw, pinwheel, pixie stick, or bubble wand. I’ve given the kids some sort of crazy straw with a homework pass attached to it each year for a very long time now. In addition to the straw, homework pass and birthday magic dust we, of course, sing to the kiddo and spin them around. But their favorite part is that they get to tell us what to do. Yep… we have to do 6 or 7 (depending on how old they are) of whatever they say. Peeps! Oftentimes they pick Burpees! Let’s just say I am HORRIBLE at them. I cringe… they know it… so they pick them… a lot! They could choose ANYTHING in the world, but they almost always pick some sort of physical exercise! This past school year I had 3 birthdays to celebrate on the same day. The first 2 seven-year olds chose burpees. That is 14 burpees in a row!!! THANKFULLY the last little sweetie decided on 7 handshakes. Whew. So, everything has been the same for a bit, but I was ready for a change in the little gift, but had no idea what to do. Hello Amazon! Who doesn’t love JUMBO pens?! I usually have 30 kiddos when all is said and done so I ordered 3 sets of 12, just be to be safe and cover myself for a “revolving door” year, just in case. I am in LOVE with them! The colors are so bright and beautiful. they are going to look great on display in the room! There are red, pink, green, purple, yellow and blue. I made a cute little gift tag to go with them. The awesome thing about this little card is that it could be attached to ANY kind of pen. Scentos or Mr. Sketch would be great hits! You can grab this little card for FREE! It’s in an editable PowerPoint file in case you’d like to type in your name. If you’d rather hand write your name, just print and go! Click HERE to grab this FREEBIE!! I’m beyond pleased with these cuties! I know my little munchkins are going to LOVE them!